Weather Master’s Mr. Plumber is your local Raleigh water heater specialist with the expertise to repair, install, service and sell industry leading brands, standard (tank), hybrid electric, and tankless water heaters. With so many water heating options to choose from these days, we’re here to offer our expertise to our North Carolina neighbors. Our professional plumbers can walk you through the pros and cons of various types of water heaters, helping you decide which best fits the needs of your household. Also, keeping in mind that water heating costs are second only to the cost of heating/cooling your home, we want to help you make the best decision for your budget and lifestyle. Whether you need water heater repair, maintenance or replacement, Weather Master’s Mr. Plumber has you covered. Standard storage water heaters store and heat water in a reservoir tank. As water is used the water heater tank is refilled and a set temperature is maintained to deliver hot water whenever it may be needed. When selecting a standard storage water heater, Weather Master’s Mr. Plumber’s qualified water heating experts can help you choose a water heater with the right capacity and energy efficiency necessary to meet your specific household needs. We are proud to offer high-quality, high-efficiency State Water Heaters. 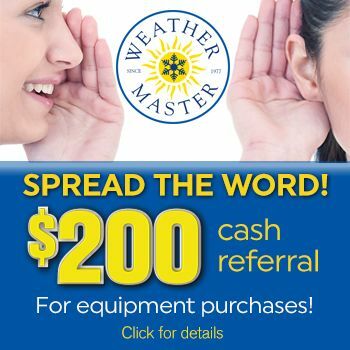 Weather Master’s Mr. Plumber offers GE Hybrid Electric Water Heaters to the Raleigh, NC area. The GE GeoSpring Hybrid Water Heater is America’s most efficient 50-gallon water heater, using up to 62% less energy than a standard electric 50-gallon water heater. Weather Master’s Mr. Plumber is proud to offer Rinnai™ tankless water heaters to North Carolina homeowners. Efficient, convenient and affordable, Rinnai Luxury Series tankless water heating units deliver more than 40% energy savings, significant space savings, and the luxury of fresh, clean hot water for all your plumbing demands. A continuous supply of hot water…only when you need it! For more on water heater repair, service or installation, or any of our other products and services, please contact us. Don’t forget to ask us about our exclusive 100% Satisfaction Guarantee!